SEE MOVIE PREVIEW BEFORE DECIDING ON THIS MOVIE. I know, this would appear an odd movie choice. You HAVE to see the preview (see link above) to fully understand this movie selection. Monkey Kingdom is a nature documentary film directed by Mark Linfield and narrated by Tina Fey. 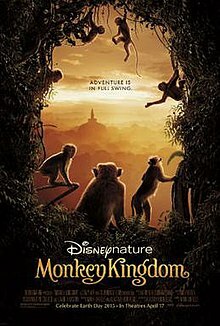 The documentary is about a family of monkeys living in ancient ruins founded in the jungles of Polonnaruwa in Sri Lanka. The film will be released on April 17, 2015. EARTH DAY CELEBRATION. Monkey Kingdom is the eighth film by Disneynature, the independent film label of Walt Disney Studios. It is slated for release in the United States on April 17, and internationally on April 23 to coincide with Earth Day. A portion of box office receipts will be donated to Conservation International. The film is directed and produced by Mark Linfield and Alastair Fothergill, who previously co-directed Disneynature’s first release, Earth (2007), as well as Chimpanzee (2012). Fothergill also co-directed African Cats (2011) and Bears (2014). The film was scored by British composer Harry Gregson-Williams, and was shot using Sony F65 cameras.